For Anyone Interested in a Turkey Day Time Saver! Ok. So, with Thanksgiving coming up this week, I am always scrambling at the last minute. This year I VOW NOT TO DO THAT!!! (ha, right?!?!?!) Seriously. At least I’m going to put forth some effort. So, I am trying to do a few Make Ahead things to help myself out. This recipe is only HALF COMPLETE!!!! So, I am posting what I have done so far, so you, my dear reader, can be ahead of the game right along with me! You’re Welcome!!! 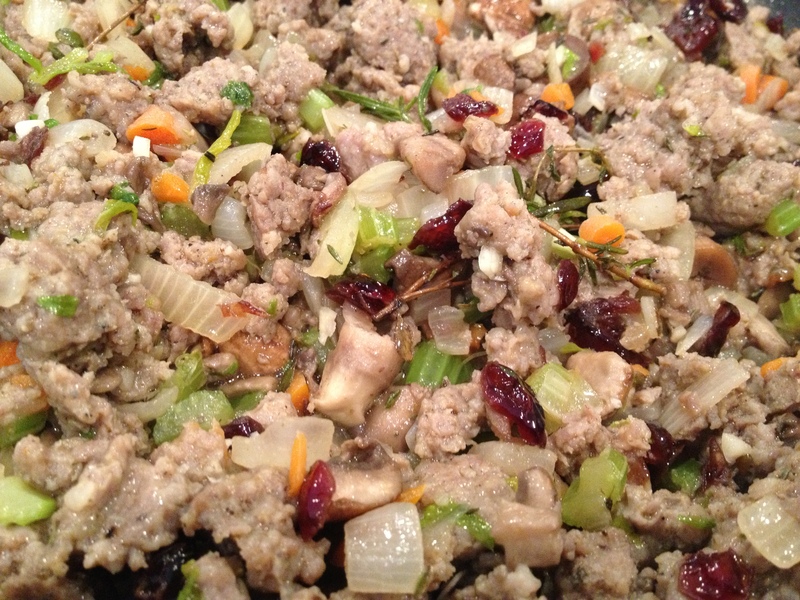 All I am doing is making the super yummy “filling” for the stuffing. 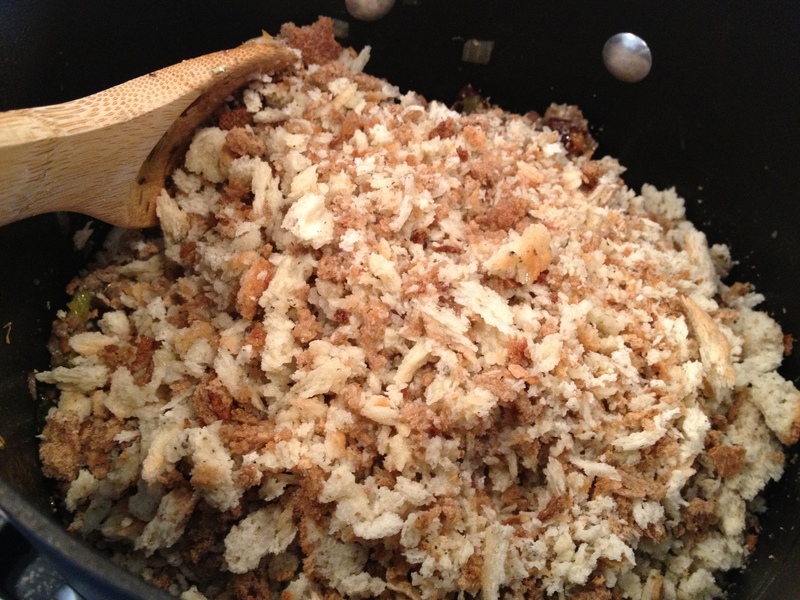 I have made TONS of different types of stuffings over the years. From Homemade Corn Bread to Rye Bread, Oysters to Sausage, and finally to Pepperidge Farms in a bag. This year I am sharing a Semi-Homemade Version using the Pepperidge Farms Stuffing Mix you can pick up at your local grocery store. Yes, I know…..this is not how I usually cook. But I was thinking of you, my reliable reader, who prefers a quick and easy method that still tastes delicious. I think you will be pleased with this one. This is super easy to make. Just get a big skillet. The biggest one you have. Or you can always use a pot if you have to. Heat up the Skillet. Add the Sausage FIRST so it can start to brown. 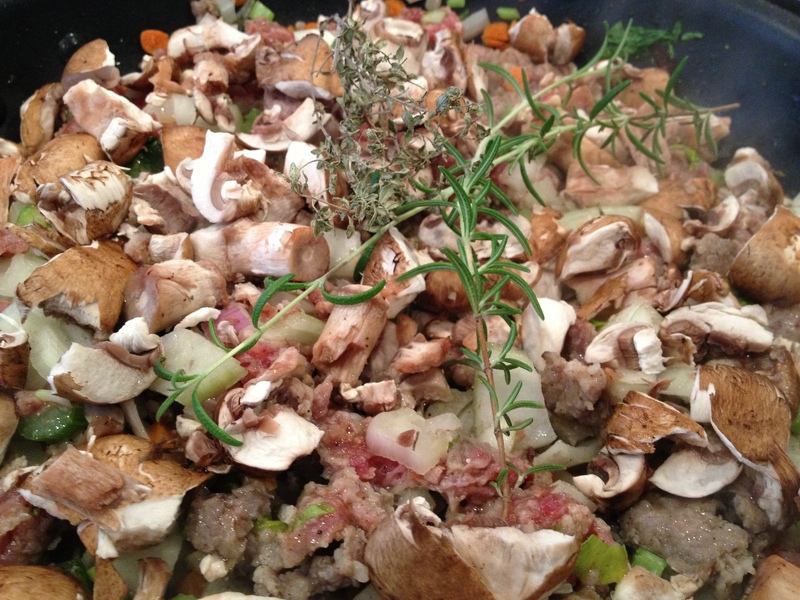 Crumble it up a bit and now add all your chopped veggies in, minus the Mushrooms, Garlic & Dried Cranberries. Season with a little Salt and Fresh Ground Pepper. Mix and let the sausage cook with the veggies. Meanwhile, if you like mushrooms, just take one in your hand and tear/crumble it into the skillet. 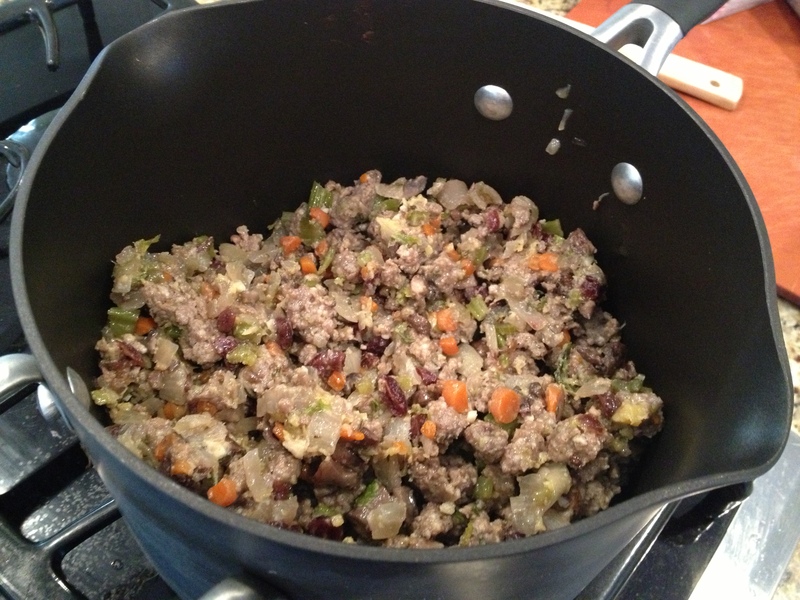 This creates a different “meatier” texture that you will love. You can slice them if you want, but I have been just tearing them into pieces with my hands for all sorts of different recipes (especially Chili) and have been so impressed. I really think you will like it if you give it a try! And, its super easy!!! Next add your herbs on top! 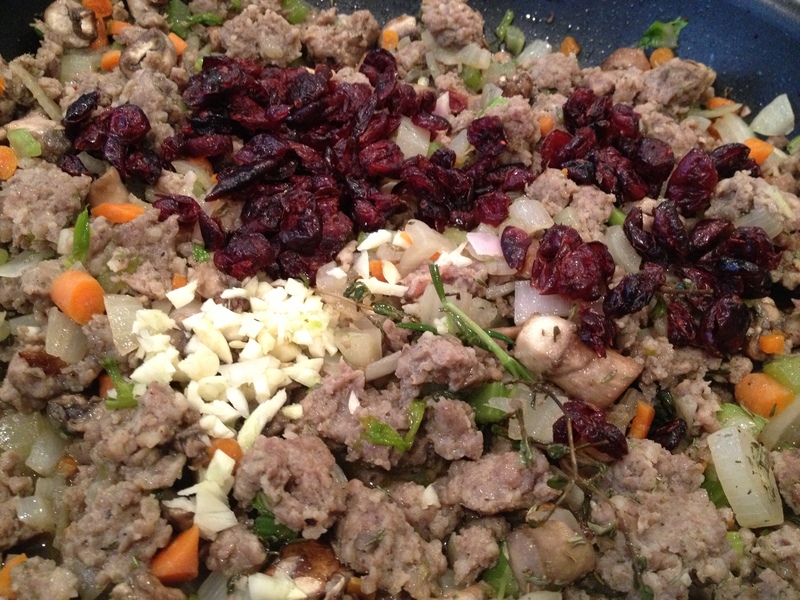 When the sausage is fully cooked, go ahead and add in your garlic and dried cranberries. Cook for a few more minutes so the garlic will soften and you should be able to smell it. Also, the cranberries will plump up a little bit from absorbing all of the yumminess. This is as far as I have gotten so far. I let it cool then put it into the fridge. I plan on warming it and adding it to the stuffing. I’ll cook the stuffing per the instructions on the package. (I think you just add some vegetable stock or water…). I’ll post the rest on Wed when I make it!!! But, it should be pretty simple and straightforward from here on! 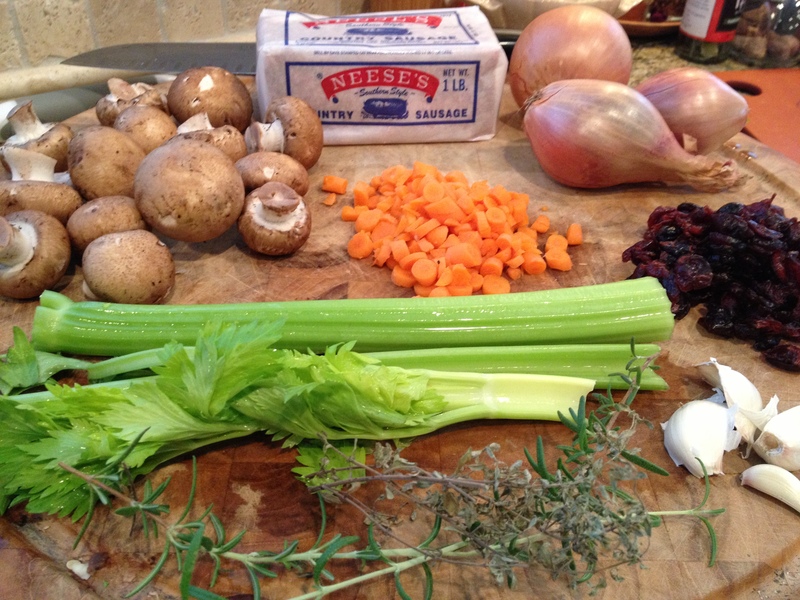 The directions on the bad just say Onions and Celery….but trust me…..this is WAYYYYY better!!!! Sorry to post half a recipe, but I figured some of you might want to go ahead and do this part!!! See Ya in a Few Days!!!! 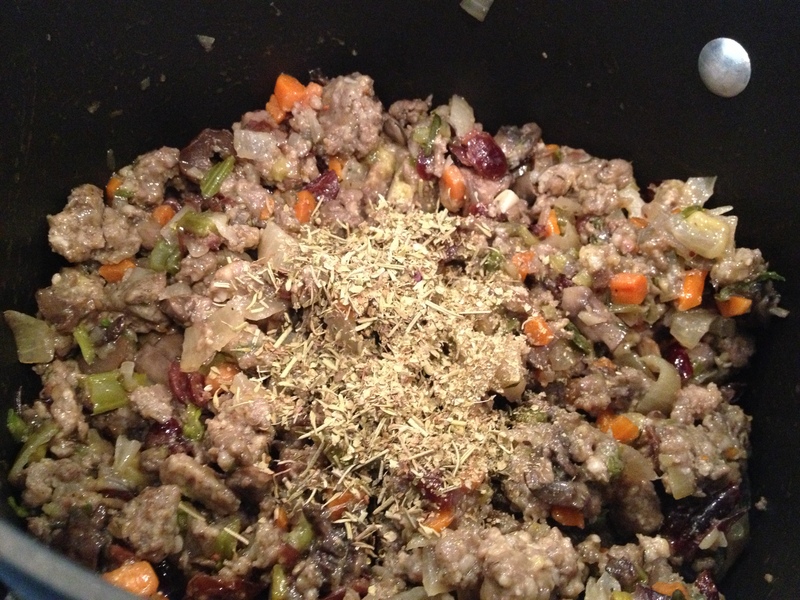 OK, so I left off with the Sausage Mixture for the stuffing in the fridge/freezer. Hopefully if it was in the freezer, you took it out last night and let it thaw out. Now, we are ready to go! Seriously, this is ALL YOU NEED!!!! It can NOT get any easier than this! In a large Pot, warm the Sausage Mixture over Med. 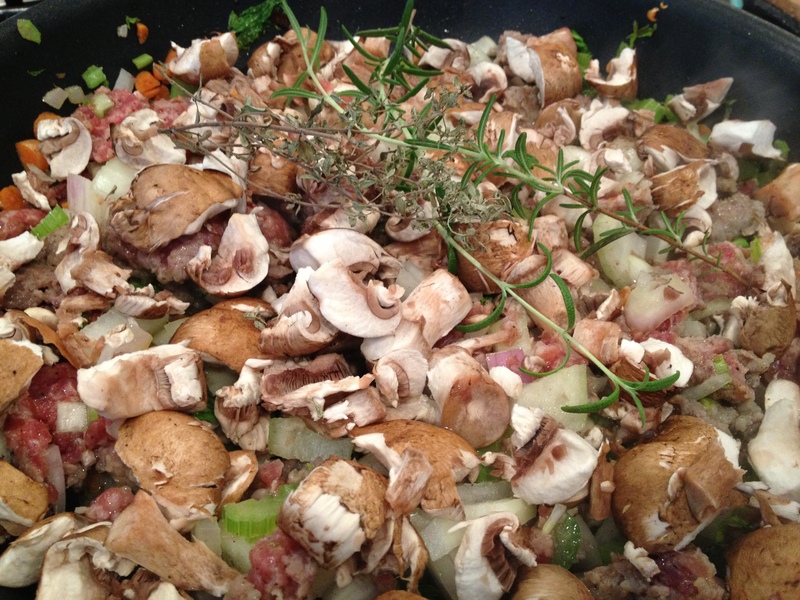 Next, add a few herbs of choice for a flavor boost. I used an Italian Mix. Sage is the BEST!!!! 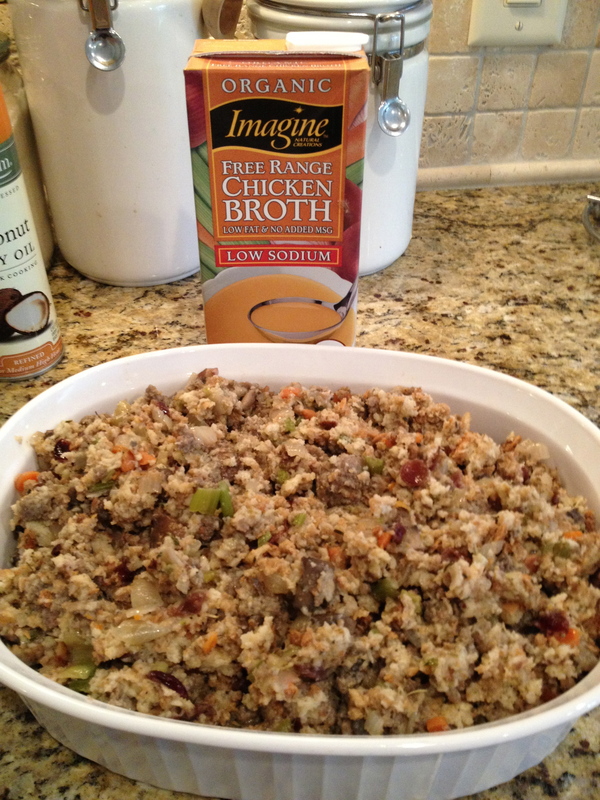 Gently Mix 1/2 of Stuffing and 1/2 of Broth. Stir. 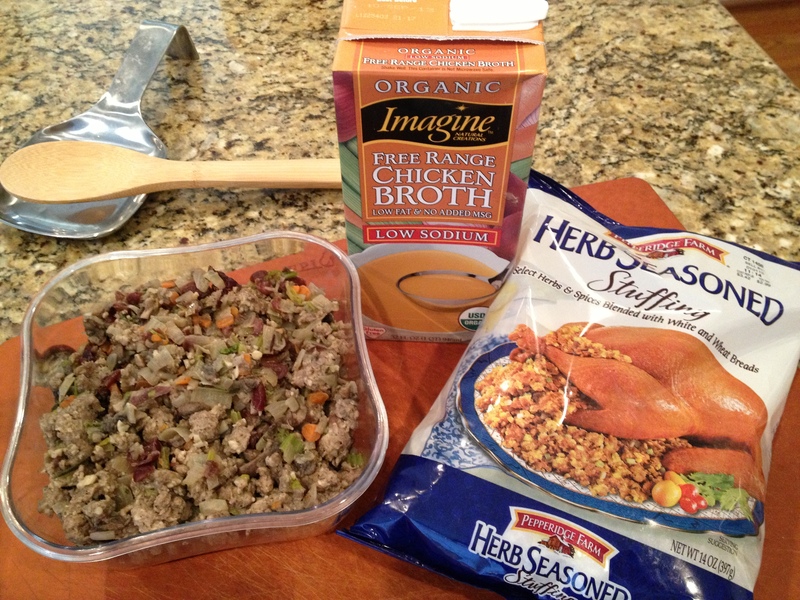 Add rest of Stuffing and enough broth to moisten. Gently Stir to Combine. 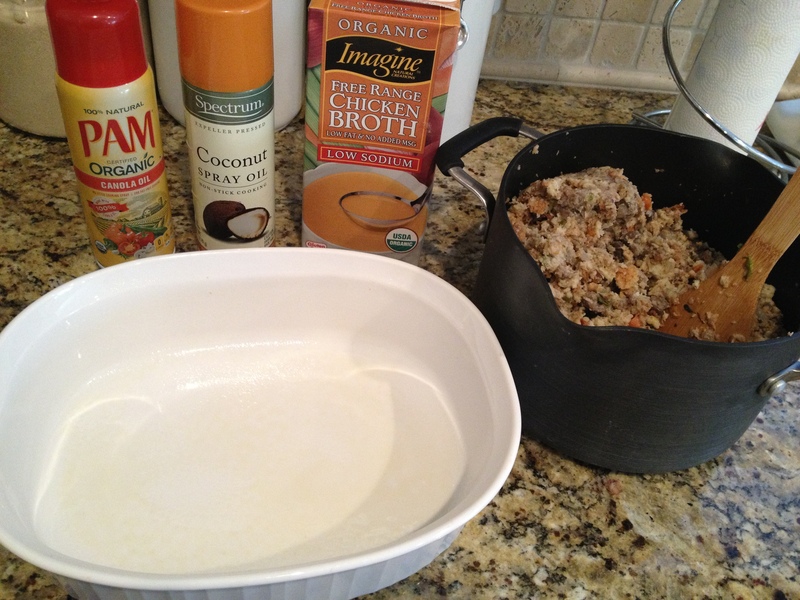 Spray your baking dish and add stuffing. I had about 1/3 of the box of broth left. Pour another 1/2 cup or so of broth over the top to keep moist while baking. Cover and Refrigerate until ready to bake! Bake 350 for 30 mins. 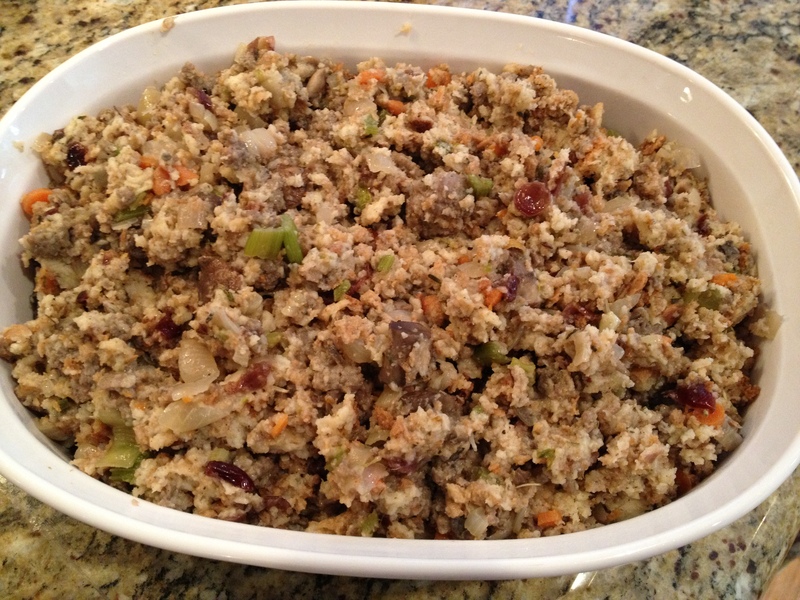 Go Get Your Stuffing ON!!!!! Gobble Gobble Gobble till ya Wobble Wobble Wobble!